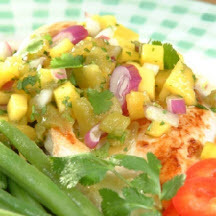 This bold tropical relish maintains its character when paired with grilled fish, meats and chicken. Combine vinegar, honey and garlic in medium bowl. Add papaya, chiles, onion, cilantro and cayenne pepper; toss gently. Season with salt.